Lovely purple stickers are great for raising Alzheimer's awareness. Adds a personal touch to letters and envelopes. 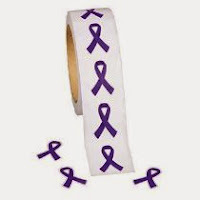 Perfect for Alzheimer's walks and fundraisers, it sticks to cards, flyers, even faces. Great for handouts and decorations. Easy to store and use.